Starting point of the martensite formation. The kinetics of the austenite transformation can be represented in a time-temperature transformation diagram (TTT diagram) (Fig.). The TTT diagram shows the starting point and the end point of the austenite transformation (austenite decomposition, martensite formation) as function of the temperature, i.e. the temperature is entered on the y-axis and the logarithm of the time on the x-axis. Per definition, the starting and end point of the decomposition are defined at 1 and 99% conversion, respectively. 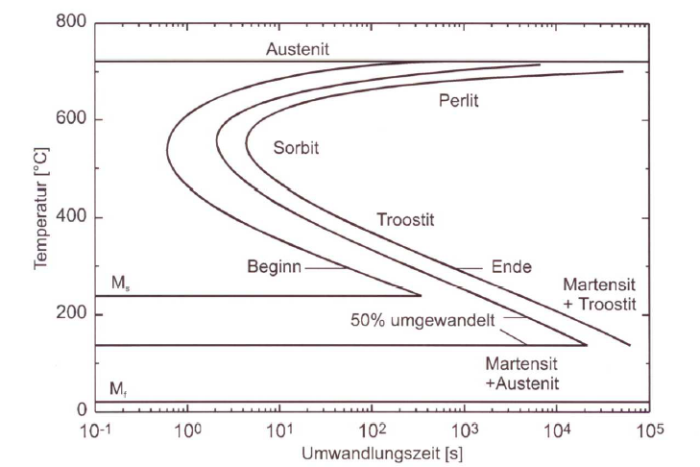 The shape of the TTT diagram and the martensite point Ms (starting point of the martensite formation) depend on the carbon content, which must therefore be given as a parameter. The Ms temperature depends on the composition of the austenite. As the carbon content increases, it is shifted towards lower temperatures. In alloys with higher carbon content, particularly in over-eutectoid steels, which were quenched by temperatures above the ES line, the residual austenite content is very significant. By adding alloy elements (e.g. manganese or nickel) the Ms point can be decreased to below room temperature. In such alloys the austenite content is more or less fully preserved after extremely harsh cooling to room temperature. As undercooling increases below the pearlite point the transformation tendency decreases. At the same time, the core formation rate increases and the nuclei growth rate decreases. This results in the typical C shape of the decomposition curve in the TT diagram.